Anchor Library, which is hosted by St. Luke’s Parish, has many environmental books for library loan. Check out the list of books here. Also check out our free publication by Dom Roberti called “Gifts Large and Small” about Gratitude. Reflection questions is available for you to use for feastdays of Mary, May or October Mary themes such as the month of the Rosary in October or the month of Mary in May. This presentation incorporates teachings from Pope Francis’ encyclical on the environment and social justice. The presentation is available in video format. Click here to view. The Sisters of Saint Joseph Earth Center is in relationship with many groups that enhance the mission of care for creation and sustainability. A special program for addressing the whole school and sustainability is available from the SSJ Earth Center. “Systemically Sustainable Schools” invites a school to look at all the ways it could lighten its carbon footprint. Pope Benedict XVI has called us to action to reduce our carbon footprint and to look at how our use of energy is affecting those who are most vulnerable. The SSJ Earth Center offers programs suitable for faculty in-service days, retreat days, and assembly programs on the topics of Care for Creation, Environmental Justice, Water, Climate Change, Spirituality and Sustainability and more. If you would like a program to be offered in your school, contact Sister Mary Elizabeth Clark at mclark@ssjphila.org for more information. *The SSJ Earth Center provides PA Act 48 credit hours for teachers. You may borrow for a week and then return. 1. Advocacy: Being a Public Person What it means to be a woman religious with public vows in the public arena/30 min. 2. Awakening the Dreamer Changing the Dream Pachamamma Alliance program /170 min. Based on The Universe Story by Thomas Berry and Brian Swimme/15min. 6. Children and Nature Featuring Jane Goodall/27 min. 12. The End of Suburbia 35 min. 13. Evolution and Religion: God After Darwin and Teilhard John Haught/1hr. The epic story of Cosmic, Earth, and Human Transformation Mary Evelyn Tucker and Brian Swimme/56 min. 23. The Living Land 27 min. How Cuba Survived Peak Oil 53 min. Global Warming and the Fate of the Pacific Islands 57 min. The Vision of Wangari Maathai How one person can make a difference. Noble Peace Prize winner/80 min. Story of Sister Dorothy Stang, a 73 year old Catholic Sister of Notre Dame from OH was murdered in the Amazon. 93 min. The life and work of the famous eco-theologian 49 min. Sacred and Profaned Interviews sharing their experiences and insights about water. 37. Bees Tales from the Hives 54 min. Discover new facts about bees and how their existence is threatened. 38. Climate Change: Our Faith Response 15 min. 39. Blue Gold World Water Wars 90 min. Turn Mankind’s Darkest Hour Into Its Finest 92min. 43. Children and Nature by Jane Goodall 27 min. 44. Cosmic Voyage 35 min. Shows where humans fit in our ever expanding universe. 45. God’s Creation and Global Warming 15 min. 46. A Sense of Place 10 min. 47. The Unfolding Story 29 min. Includes Thomas Berry, Sister Miriam MacGillis, and John Cobb, Jr.
48. Water, Sacred and Profane 27 min. Documentary of various ways water has become polluted and otherwise profaned. 49. The Future of Food 1.5 hr. 50. How to Begin Bird Watching 50 min. 63. Plastic Paradise 57 min. 64. The True Cost Shows where our clothes are made and the subhuman conditions of those who work in factories making clothes. 65. Blue Gold 90 min. Shows how wars of the future will be fought over fresh water. 66. This Changes Everything 90 min. 67. Learning with Nature 23 min. Arbor Day Foundation produced this film for presenting the outdoor classroom as an intefral part of preschool and early childhood education. Here, Sister Mary Elizabeth Clark responds to Pope Francis’ call by offering thirty lessons that will engage children, catechists, and families in the good work of keeping our planet livable and sustainable for coming generations. Inspired by passages in Laudato Si’ (On Care for our Common Home), the lessons and practical activities are fun and thought-provoking. The reflections and prayers in each lesson help connect our practical actions to the gospel and deepen our spiritual sense of our common home. 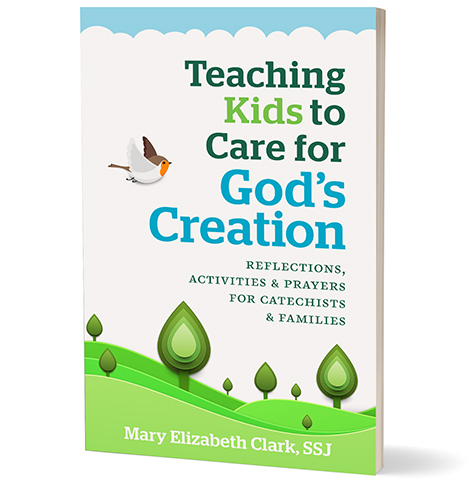 From activities for conserving water to developing a greater awareness of all of God’s creation, this book will be a great resource for catechists and families. Sister Mary Elizabeth Clark, SSJ, director of the SSJ Earth Center and Assistant for Sustainability to the President of Chestnut Hill College, ministered as an elementary school teacher/catechist prior to her many years in social justice/eco-justice ministry both nationally and locally. As we think about the opportunities we have to be in the outdoors especially in public parks such as Valley Forge, The Appalachian Trail, Delaware Water Gap Independence Hall and the John Heinz National Wildlife Refuge, we need to advocate for the funds necessary to keep these public lands open and accessible to all. See the facts here and write to your Senators and Representative in Congress to keep the funds permanently authorized in the Federal Budget. See sample letter for you to send to your Representative and Senators now. Water is life. Without water we die. The amount of water in the human body varies but its average is about 70%. Jesus told the Samaritan woman at the well that he would give her living water. Let us reflect on how we value this precious gift of water. Water on Earth is a limited natural resource. Do you know where your water comes from? Name the source of it. Water is a limited natural resource on Earth. How do you conserve water in your daily life? Do you turn off the running water while you brush your teeth? Do you turn off running water while you take a shower? Do you turn off running water when you wash the dishes? Do you refrain from using water on the lawn ? Do you use tap water instead of bottled water? Do you think about how long you stay in the shower? Do you turn off any dripping faucets? Do you remove the hose from outside in the winter?Think about the source of your water. If it is a river, how is the water purified? Whatever flows into that river from the paved areas such as oil from cars and trucks contaminates the river. Fresh water is becoming scarce. What do you do to make sure you do not put toxins into the water? Do you use natural personal care products? Are you aware of how to make natural cleaning products with vinegar and baking soda? How often do you fill up the clothes washer? Do you wait until it is full? How about the dishwasher? Do you wait until it is full? Runoff from rainfalls goes into the source of your water. Do you keep toxic chemicals out of the flow of water into the river? Have you thought about using a rain barrel to catch and save rainwater to use in your garden? Do you use cold water when you use the clothes washer? Do you wash vegetables or dishes in a pan of water rather than letting the water run from the faucet? Do you scrape dirty dishes rather than rinsing them before placing them in the dishwasher? Have you decided not to use the dishwasher for every meal rather hand wash in a pan once in a while?